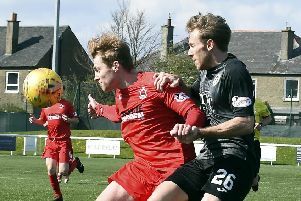 Edinburgh City manager Gary Jardine was delighted to finally land Lewis Allan on loan from Hibs. The 20-year-old striker has joined the League Two club on a development loan until the end of the season. He joins fellow Hibs loanees Aaron Dunsmore and Ryan Porteous at Meadowbank. The arrival of Allan ends Jardine’s pursuit of a youngster who has caught his eye for some time. Allan spent the early part of the season at League One leaders Livingston, where he made three appearances before returning to Hibs in October. He also had temporary spells with Forfar and Dunfermline last season after surgery to remove a cyst from his spine. Jardine revealed that City – who lost Ross Allum to Spartans last week – could yet strengthen further. “We’ve got one or two other options but that won’t be dictated to by the window as they’re out of contract,” he said.